What do 당신 prefer? 읽기 the original books, 또는 the movies? Anyone except for me being breathless the moment Julie Andrews (Queen Clarisse Renaldi) is on screen? The fans pick: Yes, she is stunning indeed! Yes, she is stunning indeed! Why do 당신 think Mia went out with JP? What are your 가장 좋아하는 인용구 from both movies? How many years has Mia been crushing on Michael? 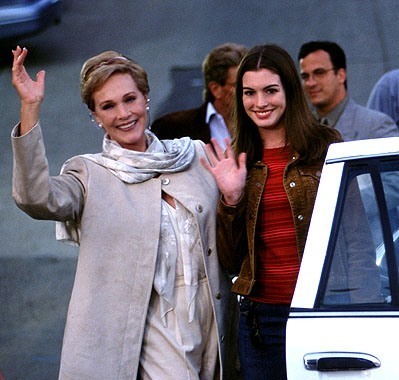 Princess Diaries,the book that tells the dream of every American girl. The lucky girl turns out to be Amelia Mignotte Thermopolis Renaldo.Who would expect the biggest dweeb of her school to be a princess of a small European nation? Nobody,of course.But that is exactly what happened to Mia.Her dad's mother suddenly appears out of the blue and tells her that she is a princess.What happens 다음 with her is what the dream of all teenage girls. Princess Diaries is a 2004 sequel to the 2001 hit directed 의해 the man who is directing the upcoming 2010 film Valentines 일 which stars one of the leads in PD Anne Hathaway Garry Marshall. Anne Hathaway played the role of "Mia Thermopolis" in the movie. a comment was made to the poll: Who Did 당신 Like Mia Best With?? a comment was made to the poll: which do 당신 prefer mia with straight hair 또는 mia with curly hair? a comment was made to the poll: what movie do 당신 prefer? a comment was made to the poll: (based of the books) Who would u want to be YOUR boyfriend? a comment was made to the poll: What was your fav. scene in the 1st movie? Who did the voice of Mia's father, Prince Eduard Renaldi? Princess Diaries 1 movie score? The Princess Diaries- The books! !